Organizer: Legendary Sujiman assisted by Fuad. Food: The worse Ramadhan buffet this year!!! Too crowded and lack of foods variety. Have to queue for 15 minutes for drinks. (Drink is not included in the RM35 buffet package). The crabs and prawns are getting smaller every year. How do you expect your one buffet line can cater all your customers? BAD = More tables = More Customers = Not enough Food = Restoran Nelayan Titiwangsa. I’m sorry for the bad review as I’m really disappointed with your services. BISADAP - I don’t really know what the meaning of that acronym is. As far as I know, they are really nice people. Deyna is one of them. 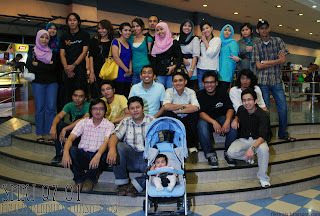 Asfahani organized for a simple but yummy berbuka puasa at Village View, Bangi. It’s a very nice restaurant with good food and services much better than SOHO Bangi. Everyone enjoyed the food so much. BTW, it was Ady's birthday that day. After berbuka we went to Asfahani's house for a simple candles blowing party. (Thanks As for the lovely choc cake) Happy Birthday Ady!!! 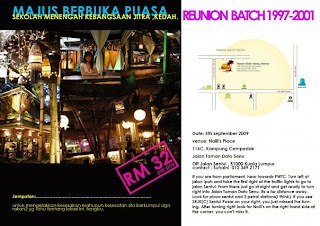 Pada 5hb Sept 2009 di Nailli's Place, Sentul berlangsungnya Reunion Majlis Berbuka Puasa SMKJ 97-01 kali pertama dengan jayanya dengan kehadiran 20++ bekas pelajar SMKJ. Terima Kasih kepada shuhaini & Amin kerana bertungkus lumus menjayakan majlis ini. Jimm dari Jepang bersama tunangan tersayang. Tauke Amin Organizer bersama keuntungan selepas di tolak cukai.